The musical Carter Family occurred as naturally as moss on the north side of a west-bound hemlock tree. During the depression, Columbia Records trimmed their Country Music stable down to only a couple acts, and the Carter Family was one of them. (The other was Jimmy Rodgers, the Yodeling Brakeman.) Then they jumped with all six feet on an opportunity to broadcast over almost the entire US from Mexico, thus skirting an FCC rule limiting station strength that would otherwise have kept them a regional phenomenon. A.P. Carter was an odd, gentle man who wrote thousands of songs, albeit few original melodies, seeking inspiration by walking railroad tracks wherever he was. Before gigs, the two women would often have to split up to try to find him, one heading up-track and the other down, and they would either find him or they would perform without him. 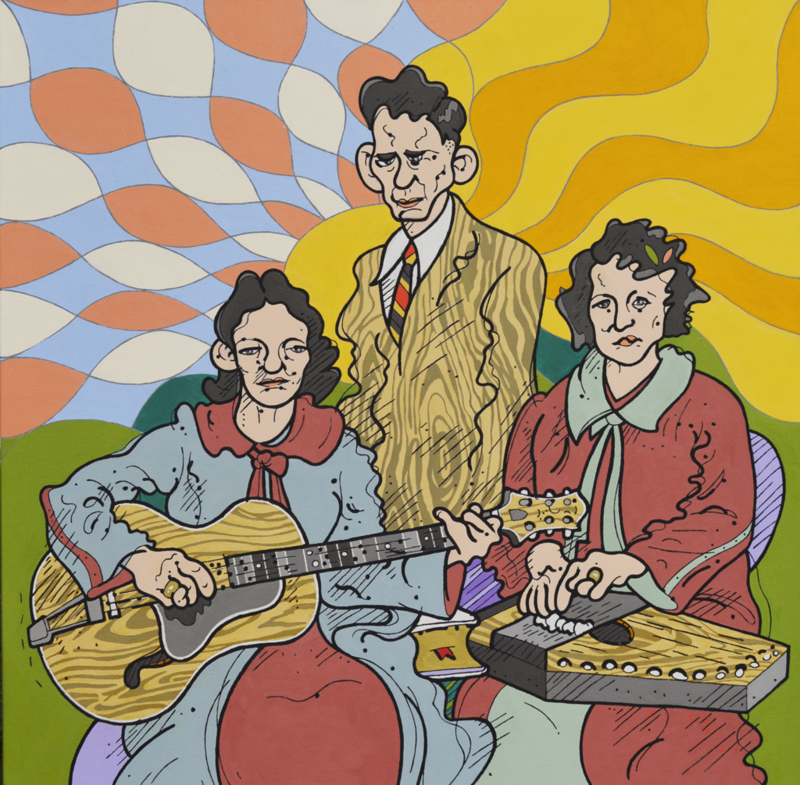 This painting is about the Carters and their acoustic music: the Hills of Virginny, my Clinch Mountain home, the Wildwood Flower and the Sunny Side, along with the earth, sky, sun and clouds. I considered old WPA posters and fashions of the time in my color selection. Classics such as Picasso’s Three Musicians (Les Tres Musiciones) crossed my mind, as well. I use a square format to suggest record packaging, a gimmick I don’t think I have overused yet. Until I do, Will the Circle be Unbroken .